Whereas Section 2 of Chapter 8 of the Acts of 1970, the Historical Objects Protection Act provides that the Minister of Education may designate any land within the Province that has archeological, historical or palaeontological significance as a protected site. And whereas that certain piece or area of land commonly known as the Fossil Cliffs, situate and being at or near Joggins in the County of Cumberland and Province of Nova Scotia is land having such significance. I, Len Goucher, Minister of Tourism, Culture and Heritage for the Province of Nova Scotia, pursuant to Section 7 of Chapter 438 of the Revised Statutes of Nova Scotia, 1989, the Special Places Protection Act, hereby amend the designation of the Joggins Fossil Cliffs Protected Site, N.S. Reg. 53/2006, made by the Minister of Education on February 24, 1972, pursuant to Chapter 8 of the Acts of 1970, the Historical Objects Protection Act, to add certain lands to be included as part of the Joggins Fossil Cliffs Protected Site. 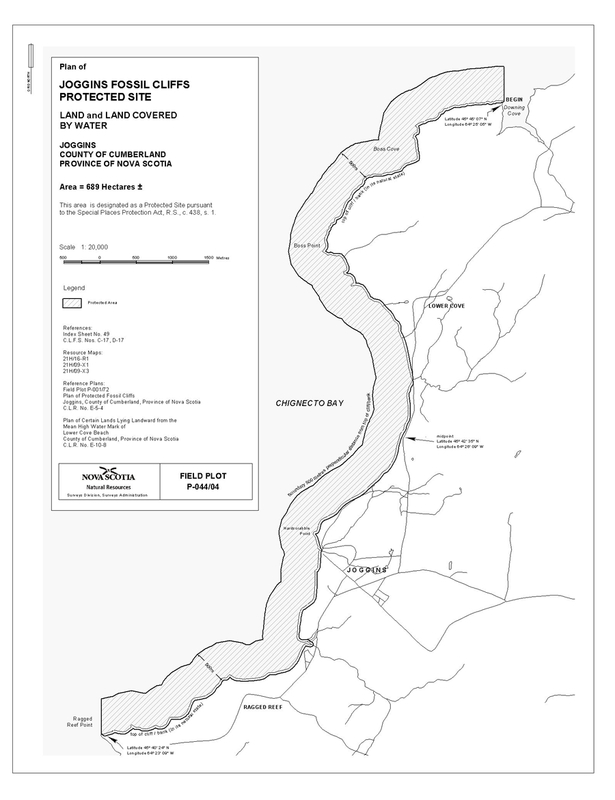 The additional lands hereby designated, together with the lands previously designated, are described in Appendix “A” and shown on the map in Appendix “B” attached to and forming part of this order. Thence due grid south to the Place of beginning. Containing an approximate area of 689 hectares. The above described parcel having a seaward boundary lying 500 metres perpendicularly distant from the top of the cliff or bank and having a landward boundary that will follow parallel to the top of the cliff or bank, as its location varies over time.